Mavis Williams, a resident of Aston but a native of Connah’s Quay has set herself the task of researching those Deeside soldiers of World War 1 named on the War Memorials. So far she has worked on the Memorials in the communities of Queensferry, Shotton and Connah’s Quay. It is a huge task she has set herself but she has achieved a lot already. It is, however, a work in progress. Mavis will be delighted to hear from any relatives of the named soldiers and she can be contacted via the ‘Contact Us’ page on this website. Click on the links below to learn more. Left, Mavis at the Memorial for Connah’s Quay and Shotton soldiers. MOLD, DEESIDE & BUCKLEY LEADER -25th March 1927. The Masonry work of the war memorial is being executed by Mr. JONES, stone mason of Connah’s Quay, who is getting on with the work as fast as possible, and it is hoped to have the unveiling ceremony in April. Sgt. Walter OWEN, Sgt. F.W. HEATLEY, Sgt. W. BROWN and Mr. Charles BROWN are looking after the interests of the ex-Servicemen, and relatives wishing to deposit wreaths at the opening ceremony should get in touch with one of these gentlemen. Set well back from the coast road, the Connah’s Quay and Shotton War Memorial at Wepre commands the attention of all who pass by. Mounted on a pedestal of a dulled silver stone a cross rears itself above everything else, telling, if need be, it’s own story of sacrifice in a war which to most people is rapidly fading from the memory. Belated thought its unveiling may be — nine years after the Great War — it is happy and fortunate thing that Connah’s Quay and Shotton should possess a memorial to it’s many sons who fell in action. To many in the vast throng who watched its unveiling on Sunday afternoon came the thought that this was more than a tribute to the dead — it was also a warning that will show to generations yet unborn what the cost of war is, and will teach them that though they must always be prepared for war the worst way of settling international difficulties is by war. 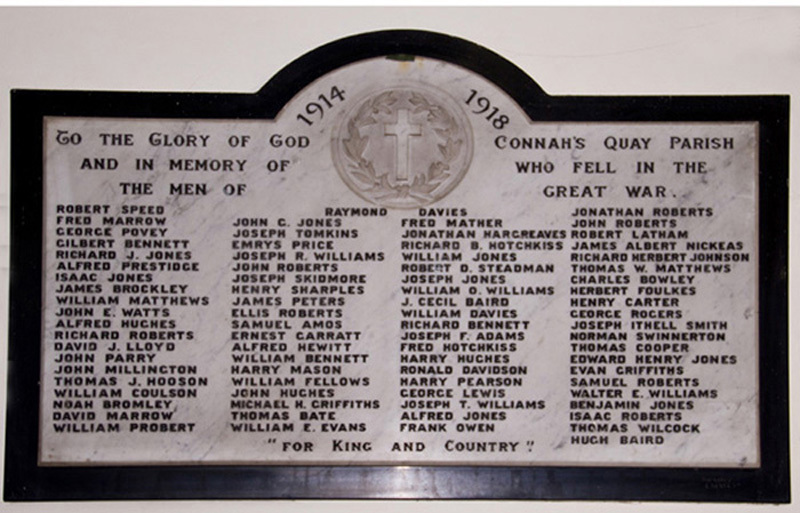 For did not this memorial to Connah’s Quay — one of many thousands– remind them that the victor paid as much as the vanquished, and that there were as many mourners and as many sufferers in the conquering countries as in the conquered? This pathetic story was silently retold by the cripples ex-soldiers, the widows and children of the locality marshalled in front of the memorial and united in common grief. To the widows and children this monument represented the desolate homes from which those men-folk went, never to return. And so, altogether, they proudly unveiled their memorial on the first Sunday in May, in a silence that was tense and with voices that were tremulous with emotion. Sectarian differences were sunk in this occasion. The crowd contained all the prominent ladies and gentlemen of the district, and the ceremony was well ordered and most impressive. A brilliant sun diffused its warm rays over the assembling crowd. There were soldiers and airmen, girl guides and V.A.D., nurses, uniformed bands from Shotton, Connah’s Quay, and the Salvation Army, but one looked in vain for the Boy Scouts. There were children clutching bunches of spring flowers, and relatives carrying large and beautiful wreaths. An exceptionally large number of ex-service men paraded under Major HUGHES and Sergt.-Major SWINNERTON, and, headed by the band, marched to their appointed places round the monument, Uniforms and medals added colour to the scene, and the setting was very soon competed in keeping with the solemn occasion. The Rev. J. Griffith JONES announced the opening hymn, “O God, our help in ages past,” and then the Rev. Owen OWEN, the Welsh C.M. minister, read the lesson, taken from the Book of Wisdom. This was followed by the hymn, “Lead, Kindly Light,” and then the unveiling of the memorial took place. This ceremony was performed by Colonel T.H.PARRY, of Mold. Addressing the huge crowd, he said this was a very real and sincere privilege to him to be asked and be allowed to unveil such a beautiful memorial. This memorial, he continued, represents or registers in the best permanent form which is humanly possible the high esteem, regard and affection in which those whose names are inscribed upon it are held by those who knew them best in the district. That afternoon, as they gathered together to do honour to the memory of their comrades their feelings must be, and were, sad. Feelings of pride and sorrow were evenly intermingled. Feelings of pride because so many from the district answered the call of duty; feelings of sorrow because so many were not there that afternoon. As he looked round at those who were once more reminded of their loss he was sure everyone’s hearts beat in deepest sympathy for them. Not only in sympathy, but they would also hope and pray tha God would sustain them in the long years which lie before them. Colonel PARRY said he had the privilege of serving with the men of Flintshire, and for faithfulness, gallantry and devotion there were none better. This memorial was a sacred memorial and it would soon be so dedicated. Let all present, irrespective of age, so regard it. Let them see not a finger is put on it to mar it any way. Let them see that the names upon it now would be equally as visible for future generation to see. The memorial answered two purposes. First of all are the names recorded upon it which reminded them all of the duty they owed to the living. This was a roll of honour, and he would say with all sincerity they could not have a roll of honour without they had a debt of honour. They knew of the promises made to those who went to the war, so let it remind them it was not only a roll of honour but a debt of honour. They still stood too near the picture to realise what those who fought had done for the country. Some day, a historian would set down the history of the war; he would give praise here and praise there, according to his opinion. But he would do something more than that. He would show the individual what he had done, and would pass judgement of on the people of today as to whether they have done what they should do for those who did so much for them. Colonel PARRY concluded his address with an appeal for the comradeship which was born of war and through which the war was won. The Rev. E.J.DAVIES, Vicar of Connah’s Quay, then dedicated the memorial to the fallen of Connah’s Quay and Shotton, and prayers were offered by Rev. A. SUNMAY, Connah’s Quay. Councillor John HUGHES, the chairman of the Memorial Committee, apologised for the absence of the Lord Lieutenant owing to the illness of Mrs. H.N.GLADSTONE. Capt. HUGHES said it was with feelings of the deepest emotion that he took part in the ceremony. There were 210* names on the memorial and each one he knew intimately. They were there to bear tribute to that memorial and to the sacrifice of the young men whose names were upon it, and who had paid the penalty of war. Such was the purpose of the monument. When they passed the memorial let them remember the brave men whose names it perpetuated. Those who came back had been the primary movers in its erection, and that day their ambitions had been achieved; it had been a pleasure to him, as chairman to see their devotion and untiring energy to erect a splendid memorial in memory of those they had left behind – on the battlefield. Their work was not yet completed. He thanked all who had so generously and liberally given to the funds, and he wished to make an appeal for a continuation of that generosity. They had overspent £40 and not until that debt was wiped off would the committee relinquish its task. Their intention was to improve and beautify the surrounding land, and not until this is done would the committee be in a position to hand over the memorial to the local authorities in whose area the monument stands. In connection with the memorial a handsome brochure has been produced and is on sale giving a resume of how the district played it’s part in supplying men. It also includes a photograph of the War Memorial Committee, which is: Messrs – W.BROWN, D. BROTHERSTONE, J.BONNER, E. COOPER, T. DAVIES, J. DOONAN, R. EDWARDS, J.J.GRAINGER, E.GARLAND senr., E.N. GARLAND, Junr., A.HUGHESF. HEATLEY, S. JOLLEY, IVOR JONES, L.JONES, P. JONES, R.E. JONES , B. LODWICK, P. LOVATT, J. McINTOCH, T.MURRAY, W.H. NORBURY, W. OWEN, J. PEARSON, W. PEARSON, D.B.ROBB, W.J. ROBERTS, G. RILEY, W. TRACEY, Ed. WILLIAMS, Ernest WILLIAMS, S.WILDE,and C. WEAVER. Mr.T.H.HASWELL, of Shotton, has also rendered valuable assistance in various ways. Post Script – Most of the Committee members had lost fathers, sons or relatives in the war, as can be seen among’st the names on the memorial. Although the great war has been ending eight and a half years, the whole of Deeside turned out on Sunday afternoon to view the visible reminder of the contribution which it made to the cause of humanity during the war. Scarcely a week had elapsed after the declaration of war before more than two hundred names of those who voluntarily came forward were enrolled in St. Ethelwold’s Schools. That list became the nucleus of the 8th Batt., Royal Welsh Fusiliers, and by the end of the month the boys of the 9th Batt., followed. Other regiments — artillery, cavalry etc., received recruits also, and many boys from the Golftyn district particularly joined the navy. One company of the 5th Royal Welsh Fusiliers had been raised in this neighbourhood, and the battalion was for a short while billeted at Flint. When the call came most of the officers, and practically, all the men, volunteered for foreign service. A 2/5th was raised in the early part of of 1915, and received many recruits from Connah’s Quay and Shotton. To keep in Memory the Men who gave their lives in the Great War and as Thank-offering for those who by God’s Grace survived it’s perils, this Memorial is raised by the people of Connah’s Quay and Shotton. And passed out of the sight of Men. But their Memory abides in our hearts. There are ten cases of two brothers and two of father and son. In a cavity beneath the base in an oaken box is placed a sealed bottle, containing a sheet of parchment, on which is set forth the history of the memorial, the names of the committee and ex-service men, by whose efforts it was raised; newspapers and military badges and buttons of the Royal Welsh Fusiliers, and other Regiments. The names of those by whose efforts the monument was erected are as follows:- W. BROWN, D. BROTHERSTON, J. BONNER, E. COOPER, T. DAVIES, J. DOONAN, R. EWDARDS, J.J.GRAINGER, E. GARLAND# (sen), E. GARLAND# (Jnr. ), A. HUGHES, F. HEATLY, S. JOLLEY, IVOR JONES, L.JONES*, P.JONES*, R.E.JONES*, R. LODWICK, P.LOVATT, J. McINTOSH, T. MURRAY, W.H. NORBURY, W. OWEN, J. PEARSON*, W. PEARSON*, D.B.RODD, W.J. ROBERTS, G. RILEY, W.TRACY, Ed. WILLIAMS, Ernest WILLIAMS, S. WILDE and C. WEAVER. * Brothers # Father & Son. Thousands of people assembled on Sunday and early in the afternoon relatives and dependents of the fallen commenced to take up positions near to the Memorial. Representatives of every branch of public life were there, including Mr. Henry SUMMERS, in whose employ the greater number of the men were, together with Lieut.Col. WILLIAMS, C.O.5th Battn. R.W. Fus., Capt. OWEN, and Supt. CUNNAH, who was in charge of the large number of police. Captain H. GOODMAN ROBERTS, M.P., in a brief address, said it seemed to him that on that wonderful afternoon in early May there need be very little said by those who were joining in their tribute and commemoration to their relatives and fallen friends. A day like that brought to them its own message — message of Spring. Every year as that time came round they learned again that what appeared to be dead was alive, when what seemed to have faded into lifelessness only sleeps, and at the appointed time it burst out again into new life and new vigour. That was not only a message of Spring, that was the Christian message, and it was in the spirit of that message, that they gathered round the Memorial. They had heard in the early part of the dedication service that “Though they be punished in the sight of men, yet it is their hope full of immortality,” and that was the message to them. They were hearing much in these hard and callous days about war memorials being too numerous and unnecessary. It was his humble belief, standing there as he did that afternoon, that each of these tokens to their own kith and kin which were raised throughout the country, should be examples of service to all. It was not only that they remembered the men who fought and died, but also the spirit in which they died. It was left to them to try and finish the work they set out to do, a work of comradeship and service. The spirit of sacrifice, duty and responsibility was the only work which would do good to themselves and to their fellow men. Might that Memorial not only be a commemoration of the deeds of the past, but also an inspiration to deeds that were to come. Captain John HUGHES (chairman of the Memorial Committee) apologised for the enforced absence of Mr. H.N. GLADSTONE (H.M. Lieutenant of Flintshire) and paid a moving tribute to those who fell in the Great War. Mr. Bell JONES also spoke in a similar strain. The War Memorial for Connah’s Quay and Shotton was unveiled and dedicated on Sunday afternoon in the presence of a very large gathering. Thousands of people took part in an impressive ceremony, which was favoured with bright sunshine. The memorial consists of a monument of Aberdeen grey granite, erected on a site near Wepre Brook, almost on the boundary between the parishes of Connah’s Quay and Hawarden. The unveiling ceremony was performed by Colonel T.H.PARRY, D.S.O., of Mold, who served with distinction with the 5th Battalion Royal Welsh Fusiliers in the Great War, and the memorial was dedicated by the Rev. E.J.DAVIES, vicar of Connah’s Quay. Other clergymen taking part in the service were the Revs. J. Griffith JONES, O.W.OWEN, H. SUNMAN, and J.J.J.ROBINSON, vicar of Shotton. Hymns were sung to the accompaniment of the Connah’s Quay, Summer’s (Shotton), and Connah’s Quay Salvation Army Bands. A detachment from the 5th Battalion Royal Welsh Fusiliers, under the command of Captain BURDON, formed a guard of honour, and hundreds of local ex-service men under the command of Major HUGHES, formed a quadrangle round the monument. Colonel PARRY in his address paid a glowing tribute to the gallantry of the men of Flintshire in the Great War. No troops served with greater devotion than the men from their own native country. He hoped that the memorial would inspire them to work in the spirit of comradeship for the great days when war would be no more. Captain E.H.GOODMAN ROBERTS, M.P. for the county, said that in these hard and callous days they heard a great deal about War Memorials being too numerous, but he believed that memorials of that nature should be to them examples of service. They commemorated not only the men who fought and died for them, but also the spirit in which they died. Let them endeavour to finish the great work which those brave men set out to do. Might that memorial not only be a commemoration of deeds of the past, but also an inspiration to deeds that were to come. Addresses were also delivered by Captain John HUGHES, chairman of the Joint War Memorial Committee; Mr. W. Bell JONES, chairman of the Hawarden Parish Council; and Alderman J. FORBER, vice-chairman of the Memorial Committee. The Lord-Lieutenant of Flintshire, M. H.N.GLADSTONE, was unable to be present at the ceremony owing to his being called to London, where Mrs. GLADSTONE is ill. In 1924 a deputation waited upon the Council at Hawarden on behalf of ex-servicemen to ask the assistance of the Council to providing a war memorial for Shotton and Connah’s Quay. It was desirable to have a war memorial for both districts as the men from them had fought together. They were also approaching the Connah’s Quay Urban Council, and the support of these bodies would be a great help. They had waited for someone else to take the matter up but as no one had done so they were prepared to move themselves. There had been a large number of recruits from the district, and they felt they should show a bit of respect for their fallen comrades, and he asked the Council to give them every possible assistance and encouragement. Mr. W. Bell JONES thanked the deputation for their attendance and the way they had put the matter before the Council. He felt sure that help would be given, but they must remember that they were not allowed to contribute anything out of the rates. What was done must be purely voluntary. He agreed with the speakers that it was a shame the matter should be left with the men who had fought and suffered. They had on the memorial at Hawarden the names of men from the whole parish, including Shotton , but this was only a small part of Shotton and Connah’s Quay and there should be a public memorial there. Mr. T.H. HASWELL said that four years ago they had met Connah’s Quay Council in an informal meeting and had also consulted the residents of Queen’s Ferry. 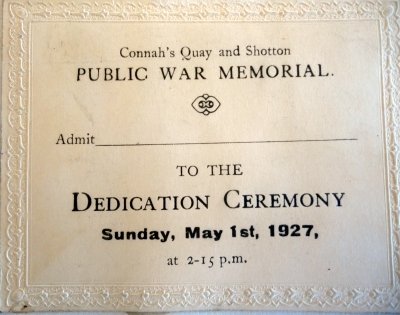 It was felt that something was needed to draw attention of the people and passer-by to the fact that Connah’s Quay and Shotton had done their share in the war. When men were wanted they went before compulsion. Between Chester and Flint there was not a single stone to mark there had been a great war or to commemorate those who had taken part. It was a shame that a district that had sent so many men away, should not have a memorial. It was a disgrace that their memories should be forgotten, and that there should be nothing to remind the people of what they had done. No assistance could be looked for from the public fund, but he felt that if an independent committee were formed and a vigorous appeal made, they would get what they wanted. They did not want something for the present day only, but something that would stand for future generation, and would show that the lads did their duty and were not forgotten. 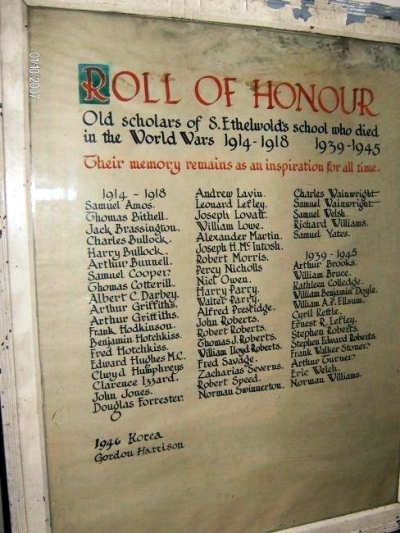 St. Ethelwold’s School Roll of Honour, now, I believe, in the new school at Aston. Thanks to Tez Fahey for the photograph. Thanks to Tez Fahey for the photograph. Remembrance day 1929.